As part of our work in Zambia we are running a recruitment drive to bring on more sales agents to sell more solar in regions we do not currently cover. 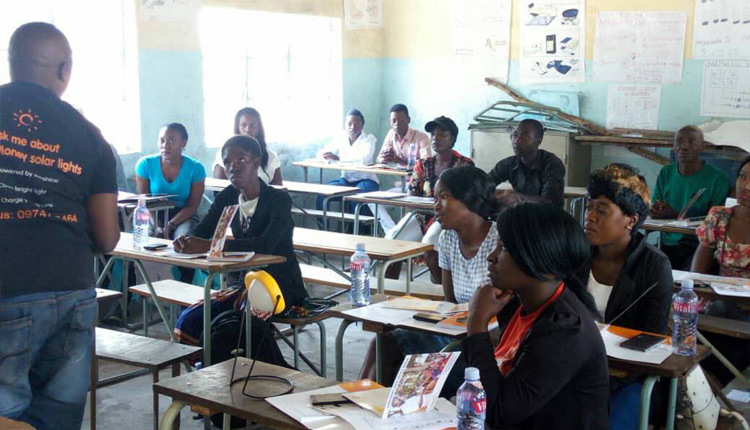 Our SunnyMoney team in Zambia recently ran some training sessions for new agents and were hoping to get about 30 people in Shesheke but 37 turned up. In Senanga they had 33 participants and in Mongu they had 28 participants. Solar is clearly a popular business! Some of the new agents have already bought lights others are saying they will pull their resources together and buy in the next few weeks. Prospective SunnyMoney agents in Zambia learning about how to sell solar lights and grow a solar business. To help make people aware of the SunnyMoney brand, and how this represents high quality solar products, and to grow demand for the new sales agents we recently recorded some radio adverts which will be aired in English in each of the areas and then in the local language as well (Lozi in Western, Tonga and Bemba and Central). The adverts encourage anyone who is interested in saving money by using high quality solar lights to call a central number which will be managed by our new SunnyMoney staff member, Austin, who will then pass on the leads to the nearest sales agent so they can meet the customer. Have a listen to the adverts – we think they’re great! Here’s hoping they help drive sales.